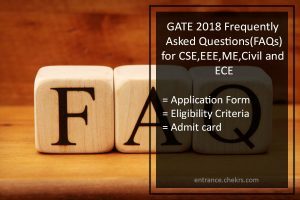 GATE Frequently Asked Questions for ECE, CSE, EEE, Mech, Civil 2019: The Graduate Aptitude Test in engineering is one of the toughest exams of engineering. The GATE 2019 Application Form will be released in the month of September. Ove eight lakh aspirants applied for the GATE exam last year and it is expected the competition will get tougher this year. The students can check the GATE frequently Asked Questions for ECE, CSE, EEE, Mechanical and Civil which are provided here. The GATE 2019 FAQ will help the students to clear their queries regarding the GATE Exam. Question. Can I use 1 email address to fill multiple GATE 2019 Application Form? Ans. No, aspirants have to use only one email address to fill their application form. Question.Why have I to choose three examination centres? Ans. The aspirants will be provided with their first preference as their centre. But if too many aspirants apply for that centre, in that case, the second or third priority will be given.For all the candidates from other six countries will have to select that particular city as their centre. the countries are Abu Dhabi(Dubai), Addis Ababa(Ethiopia), Colombo(Sri Lanka), Dhaka(Bangladesh), Kathmandu(Nepal) and Singapore. Question.If my connection failed during the filling of application form, what should I do? Ans. You have to log in again to the official website of GATE 2019 and continue the application process. Question.Only Sc/ST/PWD candidates have been asked to upload the category certificate. What about the OBC candidates? Do they upload the category certificate too? Ans. The candidates are asked to submit the documents because there is a criterion of fee in GATE 2019. Students off SC/ST/PwD/ Women candidates will have to pay a reduced fee for the application form. So that’s why for the reduction of the fee the documents are necessary. Question.How do I make the fee payment for GATE 2019 examination? Ans. There is link given in the application process for the payment gateway. Question.How do I apply Online for GATE 2019? (a) There you will find the application form link. (b) Start filling your details in the application form after clicking on the link. (c) Now you can click on the payment gateway for the payment of the application form. (d) Download the pdf of the generated application form. Question.My net banking has been debited more than once. How do I get the money back? Ans. The problem you faced because you have used the bank twice or pressed the refresh button during the payment. Don’t worry the money will be refunded if any excess amount will be deducted from your GATE ID. The amount will be refunded in 48 hours. Question.If I want the e-challan option, how should I complete the application process? Ans. If you select the e-challan option, then you have to take out a print of generated challan and you have to pay the amount to the state bank of India branch. Question.I had passed my B.Tech Successfully. I am pursuing M.Tech, can I apply for the GATE 2019? Ans. Yes, you can apply. You have to fill the application form and have to submit the details of you B.Tech in the form. Question.I have passed in 2016 but I have a backlog. Can I apply for GATE 2019? Ans. Yes, you can apply but you have to clear your backlog before August 2019. Question.I have passed my B.Tech with 50%. Am I eligible for GATE 2019? Ans. Yes, you are eligible. But you will not be able to apply for some PSUs and IITs because they have criteria of 60% or more for the admissions. Question.How many times can I appear for GATE? What is the age limit? Ans. There are no age criteria for the GATE exam. You can appear as many attempts you can. Question.I have completed my graduation through distance learning. Can I Apply for GATE 2019? Ans. Yes, you can apply. There is no specification of the mode of learning in the GATE exam but it should be affiliated by AICTE. Question.I have chosen category as OBC, but there is no option to upload the certificate. What to do? Ans. The certificate for the OBC candidates is not required in the application process. It will be required during the time of admissions. Question.When will I receive my admit card? Ans.The admit card will be downloaded only by the official link. The Admit cards will not be sent by email or post to any student. Question.Is the Admit Card Alone Sufficient to get entry to the examination Centre? Ans.The students will not be allowed to enter the examination centre only with their GATE Admit Card. They are required to bring their photo identity proof as well as the photocopy of the proof. The photo ids which will help the candidates to get entry are Driving license, passport, Aadhar card, valid college id etc. Question.Any white paper is allowed for rough work or calculations? Ans.No. The white paper is not allowed. The candidates will be provided with a scribble pad for their calculations and they have to return it after the examination. Question.Am I allowed to leave the examination hall during test? Ans.No. Aspirants will not be allowed to leave the examination hall during the test. Question.What items are allowed in the examination hall? Ans.The students with admit card, photo id and a pen will be permitted to the examination hall. Only analog watches are allowed in the centre. The facilities of water and toilet are provided to the students. For more queries, you can comment below in the given comment section.